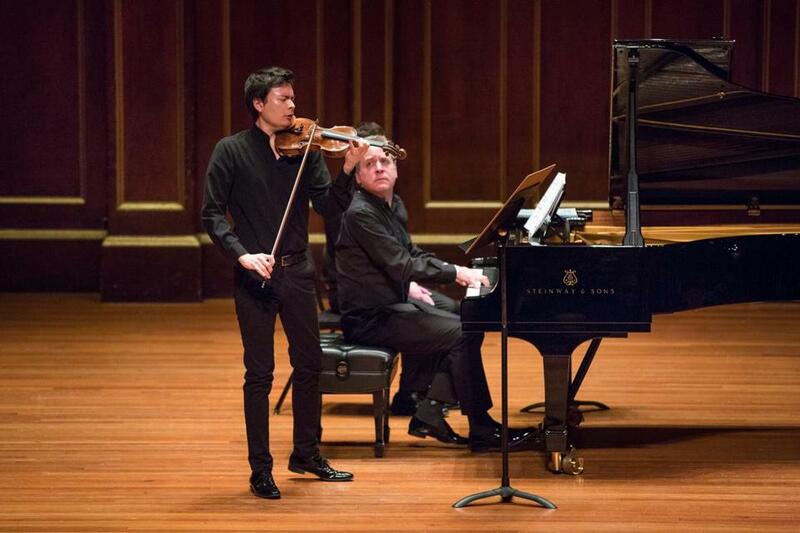 Pianist Jeremy Denk and violinist Stefan Jackiw performed an all-Ives program at Jordan Hall. In music as in most things, radical originality cuts in many directions. Place a single work by Charles Ives on a traditional recital program, and he inevitably stands out. The only question is how: as the night’s blazing visionary, its honorary crank, its eyebrow-raising enigma, or its occasion for a “let’s-beat-the-rush” quiet (though really not-so-quiet) early exit for home. So count this listener in favor of an alternative approach to presenting the music of Ives: unapologetic — even celebratory — immersion. That’s how pianist Jeremy Denk and violinist Stefan Jackiw approached Friday night’s Celebrity Series recital in Jordan Hall. They devoted it entirely to a survey of all four Ives Violin Sonatas, without a note by anyone else (save the hymn tunes Ives quotes extensively). For one thing, the immersion treatment means you get a self-selecting crowd of listeners who are there to hear what you are there to play. And secondly, the music itself thrives in its own company. With enough Ives around, the ears gradually adjust, like the eyes in darkness, hearing their way more acutely into these remarkable landscapes of montage and memory. The Violin Sonatas in particular, assembled in the 1910s, gaze fondly back into the musical world of an earlier America, the sounds of the composer’s own childhood in Danbury, Conn., in the 1870s and 1880s. Older hymn tunes enjoy a special prominence, but there are also patriotic fight songs, fiddle tunes, and more. Yet Ives being Ives, he makes us work hard to access these acoustic memories. As Denk observed in comments from the stage, the composer often inverts the standard sequence of a theme and its development. First we get mere shards of the melody, often disguised by dissonance and densely polyphonic textures, and only near the end of each movement is the full hymn tune revealed in all its glory. In a way this is not unlike the workings of autobiographical memory; it’s the bits and pieces that return to us first, and we struggle to bind them together. The profound generosity of spirit in these Violin Sonatas flows from how each one — eventually — gives in music precisely what is withheld in life: the satisfaction of a memory fully retrieved, an idyll fleetingly reconstituted, an image of home with all the notes in the right place. And it’s also Ives’s genius to make the journey back arduous enough that the arrival is both supremely sweet and at the same time impossible to mistake for the real thing. Friday’s tour of the sonatas brought one marvel after another. The slow movements cast a dreamy Proustian spell, the revival meeting spoke with religious fervor, the barn dance roared. Denk is a veteran Ivesian, and what came through most vividly was his gift for bringing out the different voices from within the dense conversations Ives always seems to be having with himself at the keyboard. Jackiw came more recently to Ives’s music, but you would never know it from his playing, marked in equal parts by confident self-possession and a rare sense of musical empathy. This pair should record this repertoire. With Hudson Shad vocal ensemble. Presented by Celebrity Series of Boston. At Jordan Hall, Jan. 26.